1. I hate to chase cash, but I can't take my eyes off a Cheverlot Optra. 2. I hate to compare myself with others, but I thrive in a competitive world. 3. I can't help but admire the concepts of Leninism and Marxism, but I'm convinced that market rules. 4. I hate leaving my home @Calicut, but I can't help it. 5. I love music , but I'm one of the worst bathroom singers and best back-bench singer. 6. I'm reluctant to give up the comforts of this software life, but the joy of bunking classes, copying assignments and sleeping in backbench morethan anything else attracts me towards college life again..
7. I hate politicians like Arjun @#$% Singh, but I love politics. 8. I'm all for idealism, but I'm very much convinced that its not pragmatic. 9. I love India very much, but the splendour of Eurpoe beckons me for a visit. 10. I convince myself repeatedly that past is past, but my inner-self brings back those memories again and again. 11. I'm convinced that path towards God is by helping others, but the suave feeling of Sabarimala trip calls me to go there again. 12. One day I want to leave all this and work in some good NGO...but not sure as on when that day will come. 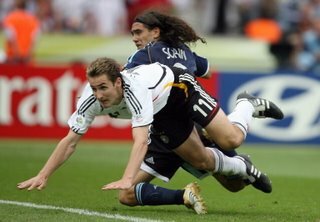 This worldcup has not been really great, but it has been far better than Japan-Korea 2002. As usual my favourites Dutch and Czech crashed out early, but after playing some entertaining soccer.. Stage is now set for the semifinals..
-- an all European affair since 1982. Lets go through some of the best matches that has happened so far in this tournament.. This game brought back the memories of Mexico Germany prequarter in 94. Awesome game with flowing football. Latin American soccer rocks. Zinedine Zidane -- The magic repeats. French seem to have a special affinity for the Brazilians at the WC. After having a rather subdued worldcup, Zidane was at his supreme best once again.Controlling the game in midfield, orchestering moves, slick passes....you have to admire this man. Though the game was a dull affair in the first half, after the French strike in the 57th minute , it really picked up. This match really exposed the lack of training as a unit on the side of Brazil.In addition to that, French youngsters Ribery and Malouda also played with purpose. Pavel Nedved -- Another great footballer goes down in history without any major international achievements. However, i feel the injury to the star players undid the Czechs. 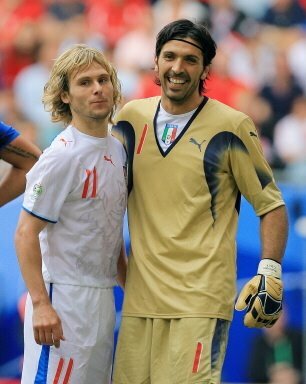 Buffon was simply outstanding in this match bringing multiple saves from Nedved , Rosicky and Co.. This was a match Nedved really wanted to win..but the Italian defense marshalled by captain Cannavaro and Goal keeper Buffon were simply imperious. The tactic of going into the match with just one forward against the meanest defense also backfired. The gap between two teams were not that big as suggested by the margin, with the second Italian goal coming in the dying stages of the match with all Czechs attacking was a stroke of luck.Had any of the earlier attempts by Nedved gone into the net, it would have been a different game altogether.As they did in Euro - 04, Czechs again go out without luck. 16 yellow cards + 4 red cards-- a world record. Here too, the tactic of playing with just one forward backfired against Dutch. 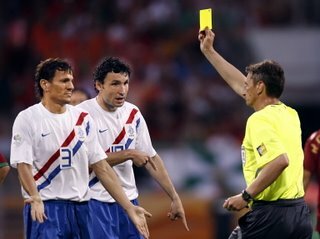 Though Dirk Kuyt's performance cannot be termed bad, they really missed the predatory skills of Van Nistelrooy in the penalty box. And Robben was throughout kept in check by the resolute Portuguese defense. Being said, if they had a bit more luck Cocu's / Van Persie's shot would have easily gone into the net. But thats football.Things dont happen the ideal way. African teams surprise as usual. Ivory Coast and Ghana carried their flag this time.But the professional approach of Netherlands was a tad over the African flair. I hope, I pray that this young crop of talented young players from Netherlands achieve something big..Let them not falter the way VanBaste,Gullit ,Rjikkard trio did after the 1988 Euro. VanPersie's freekick goal is perhaps the best executed one in this WC. Cocu moving off Ivory Coast's wall to give VanPersie a perfect slot to shoot was simply too good.This was one of the 'matches' of first round.Full credit to both the teams. Latin American teams have a natural flair to their game.And Mexico is no different.Its one of the few teams which still play something that can be called "A Beautiful Game". The game was really close. Bravo's missed spot kick finally gave Portugal the victory over a Mexican side handicapped by the injury to Borgetti. About Portugal, its Deco and a crop of young players that rule their game. ..But really, Fonseca and co gave them a run for their money.